As a simple exercise, I quickly revisited the everchanging Hansen adjustments, a topic commented on acidly by E.M. Smith (Chiefio) in many posts – also see his interesting comments in the thread at a guest post at Anthony‘s, a post which revisited the race between 1934 and 1998 – an issue first raised at Climate Audit in 2007 in connection with Hansen’s Y2K error. As CA readers recall, Hansen’s Y2K error resulted in a reduction of US temperatures after 2000 relative to earlier values. The change from previous values is shown in red in the graphic below; the figure also shows (black) remarkable re-writing of past history since August 2007 – a rewriting of history that has increased the 2000-6 relative to the 1930s by about 0.3 deg C.
This impacts comparisons made in 2007 between GISS and CRN1-2 stations. At the time, it was noted that GISS adjustments for UHI resulted in the GISS US temperature anomaly having quite a bit in common with a TOBS average from Anthony’s CRN1-2 stations. Critics of Anthony’s surfacestations.org project commented on this rather smugly – too smugly given the large differences with NOAA and CRU versions in the US and the incoherence of Hansen’s adjustments outside the US. The post-2007 adjustments to GISS adjustments change this. The increased trend in the GISS US statistic comes at the expense of reconciliation with CRN1-2 stations: the trends no longer cohere. presumably he’s too busy adjusting to have time for jousting. We by contrast have lots of time to jest with adjusters. Little did we appreciate that Hansen’s new adjustments were not in jest. Update Dec 26– Hansen’s new article on GISTEMP – Hansen et al 2010 here updates Hansen et al 1999, 2001. Section 4 contains a discussion of US adjustments under different systems, each purporting to show that UHI doesn’t matter. Later in section 9, there is a section on US adjustments, with a brief whining mention of the Y2K adjustment and the following graphic purporting to show that change to USHCN v2 had negligible impact. It is entirely possible that the change in GISS US since August 2007 is primarily due to the replacement of USHCN v1 methodology (TOBS and that sort of thing that we discussed in the past) with Menne’s changepoint methodology used in USHCN v2. Menne’s methodology is another homemade statistical method developed by climate scientists introduced without peer review in the statistical literature. As a result, its properties are poorly known. It’s too bad that the Menne adjustment methodology wasn’t published in statistical literature where its properties might have been analysed by now. It’s a worthwhile topic still. This entry was written by Stephen McIntyre, posted on Dec 26, 2010 at 10:42 AM, filed under Uncategorized and tagged conus, Hansen, Hansen, homogenization, menne, tobs, us48. Bookmark the permalink. Follow any comments here with the RSS feed for this post. Both comments and trackbacks are currently closed. In the UK, this has been the coldest December, and possibly the coldest month in my 40+ years. I have no data to back this up. Perhaps the strongest commentary on Hansen’s work is to plot the serial history of the adjustments, as you did for the latest. They don’t exactly make it easy to compare; changes are unannounced and not archived (to my knowledge). I hold the Cheifio in high regard, but I haven’t yet grasped his point about temperature being an intensive (vs. extensive) variable. In that jargon, a system can be split and each portion will have the same temperature. So, that view is clearly incompatible with ‘averaging’ temperatures, especially with air of different properties. Is he saying that GAT cannot be computed legitimately? Chaired Debate: Is Building Bigger and ‘Better’ Climate Change Models a Poor Investment? Mike Hulme: How do Climate Models Gain and Exercise Authority? Thanks to Steve Mc for hosting us all. RuhRoh – The song is written and performed by Ace lead singer Paul Carrack. He would later work with Squeeze and sing their biggest hit “Tempted”, and also be one of the main VOX in Mike and the Mechanics. Fantastic voice on that guy, and he’s acracker-jack keyboard player / multi-instrumentalist. What a talent! The impression you give is that no data should be changed unless it has been Oked by your so called audit site. I believe that Hadley/CRU have sea surface data to adjust in the 1940’s. I also believe that this is downwards. I assume you will decry this as cheating? Why do you continue to IMPLY invalid data manipulation and then wait for your acolytes to follow on with real claims of cheating? Perhaps you should help out wuwt and clean up some of the more ludicrous claims there? Leif Svalgaard must feel very lonley as he tries to defend reals science from the pseudo science bloggers there! Oh, TFP: If the adjustments were explained and otherwise documented, I’m sure that the response would be much more trusting. Undocumented adjustments made by a demonstrated extremist/advocate can’t qualify as scientific. You obviously feel very strongly about Hansen’s methods – why don’t YOU ask for an explanation – I promise to study it objectively. Like that will ever happen. Odd that the “adjustments” always (almost always?) serve to make matters worse, ie to increase the magnitude of “observed” warming. It is in the nature of things that unbiased adjustments would usually be some up, some down, and in the long run not make that much difference. Not in regard to AGW. Well that would be a good start, but possibly should be generalized to “no data should be changed without the adjustments being notified and explained in detail, with the rationale explained.” This detail should be available to all, including the very competent auditors who frequent this site. Re: thefordprefect (Dec 26 13:52), well Ford, perhaps if the adjustments were documented and the reason for such changes documented and, most importantly, the changed and unchanged data kept in separate, clearly marked and documented files, there would not be such a kerfuffle. You see, whilst you shout about these people being in a “can’t win” situation, it is in fact very easy to please everyone – keep the raw data and create new files for the adjusted data. Let any- and everyone see both files. Show the justification for the adjustments. Stop saying “trust me” without doing such things. EARN the trust with openness and transparency. Sure, it’s a lot of work and everyone is busy, but that’s even more reason to do it – people make mistakes, especially when they are rushed. How can one not criticise the lack of good science regading temperature adjustments? “I would suggest you look at NZ temperatures. … What is clear over this region is that the SSTs around islands (be they NZ or more of the atoll type) is that the air temps over decadal timescales should agree with SSTs. This agreement between SSTs and air temperatures also works for Britain and Ireland. Australia is larger, but most of the longer records are around the coasts. Can you point me to the resolution of the peer-reviewed, published, settled science behind this? cool air from the Southern Oceans up over New Zealand. has been a trend towards less northerly flow (more southerly) since about 1960. Readers need to look at the graphs to see how convincing this is. Do you not see the irony whereby the BOM, charged with the task to determine if New Zealand was warming, concludes that it was because this is consistent with a warming of the whole region, established in a manner similar to that being examined? Unfortunately, there are very many unscientific inconsistencies in the global record. GISS is not alone. “I believe that Hadley/CRU have sea surface data to adjust in the 1940′s. I also believe that this is downwards. prediction, but these errors are never accounted for or displayed. If Brohan 2010 learns the lessons of the past they will supply all the data and all the code. If not, then, people will make charges. A wise man would forestall that by doing what a scientist should do. How long will it take the “climate science” team to understand the lessons that have been learnt by all other scientific disiplines. i.e. the hardest thing any scientist faces is to remove the influences of biases that we all have? TFP – don’t generalize about ‘scientists’. Many climate scientists, (co called), are reluctant to supply raw data and algorithms. Here is a typical/leading climate scientist’s response to a request for information: “Why should I give you my data when you just want to find something wrong with it?”. This is not the typical scientist’s attitude, training, inclination, or behavior. Surely many main stream scientists would deem sceptics doing them a favour by finding fault in their data so that this could put them back on the right track sooner,saving further embarassment. From another angle, wouldn’t allowing sceptics to concede finding no fault in the data and the sampling method/code be the ultimate thumps up on the AGW course from the sceptic camp? Unless there was and still is geuine doubt/concern even to the warmists and fear led to denial. Who then is the denier? Actually, that is a “main stream scientist[‘s]” attitude by and large. But what’s important is that in OTHER sciences, that attitude is mitigated by the knowledge that the data WILL be examined. There WILL be “peers” out there scrutinizing conclusions, calculations and data. That in turn often elicits a paranoid and OCD pattern of behaviour where every bit of data is preserved, every transformation documented – in lab science that is what notebooks are for and why they are kept in ink. They know that some critic will be looking to shoot them down – what really drives science is the chance to turn to a colleague and say, “see, I said you were wrong.” The watchword is “document, document, document!” That way ideally, if you flubbed it, you can catch it before some graduate student sees a window of opportunity to initiate a Kuhnian paradigm shift by relieving themselves on the head of the giant upon whose shoulders they are perched. In the middle ages, we have church review. From the 80s, we have peer review. Before long it became buddy review. But there is hope, we now have blog review. Are these adjusted (but referred to as unadjusted) temperatures the input into GISTEMP? GIStemp takes as input GHCN, USHCN and some Antarctic data sets. The “adjusting” is done to the GHCN and USHCN. Therefor the “uadjusted adjusted” tempertures are the input to GIStemp. It is a little more complicated than that as NOAA / NCDC make an “unadjusted” version (that has adjustments for some things in it) and an “adjusted” version that has even more adjustments in it. You need to look at their data set descriptions to find out exactly which adjustements are in each AND do a lot of digging. So I guess the answer is “It depends on WHICH adjustment” as some are in the imput to GIStemp and some are not. While it is desirable to have the most consistent measurement records possible, it is even more important to have a credible record, especially if important public policy is involved. It is not clear that the current administrators of these records are conscious of that responsibility. As is, the adjustments over the past century appear comparable to the magnitude of the warming detected. That seriously raises the importance of those adjustments. At a minimum, these need to be backtested, by comparing old vs new procedures for a long enough period to be reasonably confident that the adjustments are in fact appropriate. The plots above are for US48 – a very insignificant area of the total globe. Whatever the adjustments to the above figures are they make very little difference to the global average. I don’t have nearly the expertise of others here, but this type of observation always puzzles me. First, points are trivialize by saying whatever area in question is insignificant to the area of the globe. Second, if it is “very insignificant” as you point out, why make the adjustments in the first place? Maybe a bunch of “insignificant” become significant at some point? So how much should the adjustment be for the 75% of the Globe that we know that the data is at best ‘poor’ or at worst ‘non-existent’? If I strip away all the meandering and snark, the only content left is that Hansen’s adjustment has changed and you don’t like the direction. You don’t supply any mathematical rationale for why the revised adjustment is incorrect. Nor what the total impact on the trend itself is. Rather than complaining your self, how about talking to Hansen or Jones or the IPCC… and having them do a complete paper explaining not just what is being done but the REASONING AND RESEARCH TRAIL SUPPORTING what they have done and are doing!! One of Hansen’s adjustments was to increase all data points after a particular year and to decrease all data points prior to that same year. Hansen did this on a sliding scale so that the magnitude of the adjustments increased positively going forward from that year and decreased going negative3ly from that year. As an engineer, I can accept that data might need to be adjusted from time to time for some reason. I would expect that such an adjustment would statistically cancel out and not contribute to a (or create) a trend. I checked the data myself by comparing pre-adejustment yearly average temperatures with post adjustment yearly averages. I loaded it into a spreadsheet and substracted one set from the other. When I saw the results that I described ablve, I thought that I had made a mistake in my spreadsheet. I checked and re-checekd the spreadsheet several times, until I was certain that I had not erred. Perhaps you can enlighten me as to what sort of an error would need corrected by such an adjustment. I am at a loss to explain this. Brooks, do you have a link to yur results. It sounds like a powerfull represnetation of the adjustments made so far. I do not have it on this computer. I believe that the Excel file is on my Terabyte drive. I am now several thousand miles from it. I’ll check after the 1st of the year. Your statement is dripping with irony. Someone who made the adjustments should be showing us the mathematical rationale for why the adjustments are *correct*. Then we might be able to tell you if there’s any for why they are not. “The plots above are for US48 – a very insignificant area of the total globe. It depends on the number of data points used in the calculation of the global average. With the African continent being a non-trivial area, it may be that it contributes only a trivial number of points to the calculations compared to the number used from North America, mainly the USA. Continental USA Trivial? Not really. The data is applied to a grid and weighted by area. Each missing data point can be ‘filled in’ from up to 1000 km away. The data goes to the next step where it is “homogenized” against data up to 1000 km way (that may include ‘synthetic data’ from the first step). The data then goes to a UHI correction that can use data up to 1200 km away (IIRC, it might be 1000 km at this step.) So at this point it may be using data that started out 3200 km away. That’s the potential “reach” of USA data. When I complain about the “Serial Application of The Reference Station Method” or “The Recursive Application of The Reference Station Method” this is the impact I’m talking about. The published paper that shows a 1200 km correspondence of “trend” does not justify being a “Serial Adjuster” or using a “Serial RSM”. Oh, and as the thermometer count drops from year 1990 to 2010 (from 7280 thermometers to 1260 or so) the degree to which GIStemp must “reach further” at each step increases… Station drops DO matter. This is plainly not true, since if it was there would be no empty cells at all. Missing data are not filled in from 1000 miles away – that is only done locally. The UHI correction for non-rural sites is irrelevant for the regional trends. And whether the reach changes as the number of stations drops depends absolutely on the distribution of the remaining stations – every independent analysis has clearly shown that it doesn’t matter at all (Zeke, CCC, etc.). The CCC code is easy to install and run – why don’t you actually use it to demonstrate any of your claims? Re: E.M.Smith (Dec 27 17:03), unfortunately i can select 100-200 stations at random and see no effect. drops do not matter, except to the final uncertainty. And no I dont use stations 1200km away to adjust. I can get the same answer with a 5 degree bin, 3 degree bin or 1 degree bin. I hazard I could even go lower than that. and it doesnt matter how many stations you have per grid. i’ve even tested with 1 station ( ranomly choosen) per grid. Actually you can get the same answer if you remove all airports as well. as a previous poster already suggested, doesn’t that lead you to start questioning the data if slicing and dicing makes no difference?? That no matter what you do you obtain the same trend?? We aren’t talking about a climate controlled biodome after all!!! It’s less trouble to simply draw a graph that suits your purpose. Nobody will ask you for the raw data; if they do, you just refuse. unbelievably, being the key word. Actually no, what it means is this. Over a substantially long enough period the distribution of the trends of all stations is approximately normal. For example the mean would be something like .8C and the full distribution would go from zero to 1.5C. thats for 4000 stations, say. It has NOTHING to do with the data being perfect and everything to do with the distribution of temperature trends. You then can try to see if dropping all high altitude stations matters. been there done that, no difference. You can drop all airports. no difference. You can drop all urban. nothing. The question is is the definition people use of urban correct? For a long long time I have been suggesting that the key to finding the UHI signal lies in having GOOD metadata. Imhoff has taken a great step in this direction. And he has shown the effect in some limited cases. I would hope that someone could duplicate his work and focus on the 7000 locations we use to measure temps. That is entirely doable. THAT should be the focus of peoples attention, not stations dropouts, not hansens refernce method, not his UHI adjustment. Those are just distractions from the real question. IMHO, if you get .8C from ANY 100 randomly picked stations it isn’t random. I can go looking through the GISS station graphs and find 100 stations with ZERO warming. And some with cooling since the 1930s. I have no idea whether the former population figures are readily available, however. In what decades was the .8C anomaly accumulated? Was the .8C accumulated in the same decades? Were those decades ones in which CO2 rose by a significant amount? Betcha in Australia it’s going to be closer to 0.3 deg C since 1900, after the falsities are adjusted back. Can anyone give me a reason why many truly rural coastal stations here tend to be rather level over the last 40 years, while rural inland stations say 300km or more from the sea, but at low elevations say below 300m, tend to show increases? Please don’t say that the sea moderates. The inland trends go stupid if you project them forward or back at these rates. In a word – rainfall, or perhaps evaporation. We have been – told by various media outlets especially – that the temperature increase caused the big dry. Yet there is (Australian) published science suggesting that it was other way around – that the dry caused the heat (or perhaps more accurately, a loss of evaporative cooling). Perhaps our recent experience with floods may help, ahem, settle the matter. It’s hard to see rainfall or evaporation giving a 40 year trend, because something has to start and end the trend. BTW, have you seen any proceedings from a climate conference Uni of Tasmania about May 2009? It mentions changes in rainfall and cloud at Macquarie Islandand probably other places (pers comm BOM) but I can’t seem to find the proceedings. Fortunately, Dr. Hansen soon approaches retirement, and will no longer be making adjustments. I expect ‘cooler heads’ will then have more sway over what are valid adjustments. I wouldn’t hold your breath Steve. You can bet, that even though Hansen reaches retirement age, they’ll pass a special law to confer a Emeritus status on him. Emeritus (def) Retired or honorably discharged from active professional duty, but retaining the title of one’s office or position. So NASA may not have a choice. He’ll be free of “official” duties, but will still be able to be arrested at protests as a “NASA Climate Scientist”. The engineering profession has developed the concept of published standards and standards committees to create them. A standards committee is a group of experts whoa re assembled either by invitation or by general request. These experts work in a defined process which usually consists of submissions for the amendment of a proposed draft standard. As a result, a standard moves from a plurality of competeing ideas to a rough consensus on the topic. This blog works over many many standards that were created in this way that enable to functioning of the Internet and the WWW. I find it quite puzzling that this is not the procedure followed in the creation of a standard as important as that which guides the adjustment of temperate records. Considering the potential effect of AGW, the current practice of relying on independent academic researchers with rare peer review and publication seems to be quite bizarre. My suggestion is that temperature standard be regarded as an engineering problem. Similar work in strnght of materials etc is clearly regarded as engineering work. The engineering practice can then be followed in creating a transparent and clearly explained standard for the creation of temperature records. There would be no ‘hide the decline’ ‘tricks’ in such pracrice unless everyone was aware of what the trick was about. Correct as usual TAG, but who is listening? Certainly not the EPA, NOAA, WMO or IPCC. They already have a system that works quite nicely, for them. Why would they seek consensus, when they claim to have it already? Backing off from that position would be an admission of error or guilt (either works). the only content left is that Hansen’s adjustment has changed and you don’t like the direction. The changes in the GISS US temperature adjustments since August 2007 are very large (~0.3 deg C) relative to the size of the trend in the most studied and measured area of the globe. Surely that deserves to be noticed and explained regardless of the direction. The size of the change is surely very surprising regardless of the direction. Hansen et al 2010 is a very recent publication on GISS methodology, but did not contain a reconciliation of why the new adjustments differ so remarkably from adjustments believed to be satisfactory at the time of AR4. It is surely Hansen’s job to present a mathematical rationale for why these new adjustments are correct relative to the former adjustments. Why didn’t the peer reviewers ask Hansen for such a reconciliation? At present, I don’t know whether the changes arise in modifications at GISS or at USHCN or both. If people critical of my merely noting the new adjustments can clarify this point, I’m sure that readers would appreciate such a reconciliation. Didn’t you ask for the code? And get it? Hasn’t he written papers? Haven’t you studied how these adjustments are done in the past? Perhaps you don’t have what you need now to understand the numbers, I don’t know, but you don’t actually say that (in the post, Steve). Capisce? What is lacking? Have you even started to do any analysis or is this just an inital post saying, look a change (along with a bunch of snark and Chefio/Watts (uck) love? Steve: TCO, in a business situation, changes in accounting policy are not encouraged by independent auditors (to say the least) and must be presented with a detailed reconciliation to previous accounting policy. This is the responsibility of management not auditors. As you say, I’ve dug into these algorithms before and could doubtless do so again. Other people have now worked through the mire of Hansen’s code. Perhaps one of them can explain what’s going on here if Hansen is unable or unwilling to explain what he does. I have limited time and energy and surely it’s unreasonable to hold me responsible for not doing what is Hansen’s obligation. What Peter Wilson said! Lots of trolls about with nothing of consequence to do or say. Do trolls get Christmas presents? Does Santa count them as naughty? The questions Steve McI raises in the body of this post appear quite reasonable, to this only-modestly-informed outside observier. TAG’s 19:03 follow-on remarks framing the issue in engineering-standards terms also seem quite sensible. By the same token and in the same spirit, Scientist’s critiques of Steve’s critique raise worthwhile issues. The field would be better if all such critiques were weighed and responded to, when it can be done. And it usually can be. The issues have become so personalized and so bitter that it’s very difficult for scientifically-literate laypeople to know where to begin. Much credit would go to the individuals who turn away from this course, and re-focus on the technical issues. It’s up to the scientists(s) doing the analysis and writing the paper to adequately explain all features apparent in their analysis. Third parties CAN look for explanations, but it isn’t their obligation. Steve gets to do the work he wants to do, not the work you want him to do, unless you can arrange a contract with him. One lesson we have learned is that making our global data analysis immediately available, with data use by ourselves and others helping to reveal flaws in the input data, has a practical disadvantage: it allows any data flaws to be interpreted and misrepresented as machinations. Correcting data known to be bad is extremely subject to the biases of the adjustor since they invaribly rely on ad hoc adjustments that are tested to ensure they produce the ‘correct’ results (i.e. results that are believed to be correct by the adjustor). Hansen has long since despensed with the notion that he is a impartial scientist. He is a political activist and therefore the onus is on him to prove beyond any reasonable doubt that his biases did not affect his decisions about the adjustment algorithms he choose. Which is just another way of delaying and obfuscating any true analysis until after the press releases. As Ross observed long ago, calculation of a temperature index is the same sort of activity as calculating a Consumer Price Index. Ross (and I) long ago suggested that it would be far better for all sides of this debate if it were done by a governmental statistical agency rather than parties with an interest in models and active concerns about policy. That would avoid some of the criticism that has occurred in GISS’ occasional pratfalls. As I observed at the time of the Y2K issue, Hansen could readily have avoided much of the controversy by making a timely and straightforward change notice, instead of making wholesale changes without acknowledgement or notice. Hansen’s practices in respect to change notices and disclosure have improved markedly since then. Steve, GISS is a government agency — not statistical but scientific — and concerned with the science of climate. It’s appropriate that such an agency to be doing the work. The issue is that the agency has been captured by an activist, who has apparently crewed the agency with others who are convinced similarly. There’s no reason to think that a government statistical agency could not be similarly captured. Jim Hansen’s views could just as well find a home in the breast of a statistician. And, for example, likely has done in Colorado. So, I don’t see your option of a government statistical agency as a solution. The solution is adherence to professional integrity. No system, after all, is any better than the people running it. Illustrating one example of why Steve is mistaken to suggest that assigning the task to a government agency is likely to improve quality. It might, for a time. But “capture” is all but inevitable when it comes to government agencies. Naturally, it’s sensible to suspect private entities of self-serving behavior. It does not follow that the public sector should not also be suspected of it. shewonk: then when corrections are submitted would you expect them to be implemented? and if they were not implemented what would your judgement be. 3. suspend judgement until the corrections can be assessed. It is a couple of months since I last looked at GHCN/GISS/NCDC data and methods in any detail. I did look briefly at the changeover to nighlights-based adjustments here: http://diggingintheclay.wordpress.com/2010/07/10/gistemp-plus-ca-change-plus-cest-la-meme-chose/ I found it odd that there was so little change overall, yet the more deeply you look the bigger the changes (Figures 4 and 5). Since the adjustments are mediated though classification by population size (whether though nightlight estimation or previous method) the correct assignment becomes crucial. I have not followed this up although it is something I felt needed further investigation. Peter O’Neill (here and subsequent posts) pointed out the location errors affecting nightlights classification for many stations and now Steven Mosher has followed this up. Overall the proportion of location errors is probably small and many not have a significant effect, but the point is – this is a set of errors that shows the due dilligence is not there. If you are basing your analysis on geolocation – you make sure your lat/long is error free. Now also (IIRC) NCDC have started adjusting for UHI in the ROW as well as in the US. Something makes me think this started in November 2009 for GHCNv2, but I could be wrong. This means that the NCDC adjusted data, which is the INPUT for GIStemp has UHI (and TOBS/SHAP etc) already accounted for – using a type of homogenisation method (e.g. as described by Menne et al here slide 15). So the Hansen adjustments are providing a second tier of adjustment that should be unnecessary. In the US, I think (and this is a surmise right now) that looking at the nightlights adjustment relative to Menne-adjusted station data is locking the barndoor after the horse has left the barn, so to speak. My impression is that the Menne adjustment will smear bright station histories into dark station histories. After the Menne adjustment, my surmise is that there won’t be much difference between bright and dark stations. The more interesting analysis would be bright vs dark before Menne adjustment – which doesn’t seem to have been presented in the Hansen analysis. Re: Steve McIntyre (Dec 26 22:27), Its unclear in both hansen and Menne whether the homogenization is done between “like” stations WRT nightlights or urbanization or not. I believe ( pers comm) that the homogenization does not take into account the character of the station. Thus “smearing” UHI signals if they are ( like I contend) high frequency affairs. That is, since UHI doesnt happen every day ( snow, clouds, winds, rain amerliorate it) and since it is seasonal, then it is likely to be a high frequency affair. Homogenization will remove or smear or filter the most extreme events. Then if you try to find UHi in a homgenized series you will be looking for a needle in the haystack. Jennions, similarly, argues that the decline effect is largely a product of publication bias, or the tendency of scientists and scientific journals to prefer positive data over null results, which is what happens when no effect is found. The bias was first identified by the statistician Theodore Sterling, in 1959, after he noticed that ninety-seven per cent of all published psychological studies with statistically significant data found the effect they were looking for. A “significant” result is defined as any data point that would be produced by chance less than five per cent of the time. This ubiquitous test was invented in 1922 by the English mathematician Ronald Fisher, who picked five per cent as the boundary line, somewhat arbitrarily, because it made pencil and slide-rule calculations easier. Sterling saw that if ninety-seven per cent of psychology studies were proving their hypotheses, either psychologists were extraordinarily lucky or they published only the outcomes of successful experiments. In recent years, publication bias has mostly been seen as a problem for clinical trials, since pharmaceutical companies are less interested in publishing results that aren’t favorable. But it’s becoming increasingly clear that publication bias also produces major distortions in fields without large corporate incentives, such as psychology and ecology. I doubt that the proportion of location errors is small. In Sweden (19 GHCN sites) more than half have location errors larger than the 0.01 degrees postulated by Hansen. Both the two “zero nightlight” sites have very large errors (25 and 30 km) and are “zero nightlights” only because of these errors (one is misplaced into the middle of a large lake and the other in the middle of an uninhabited forest). I suspect that a revision of the 500 zero nightligt sites might yield rather startling results. A “revision of the 500 zero nightligt sites” might well yield rather startling results. If, instead of a paper in a learned journal, Hansen’s work had been reported in a submission to an engineering standards committee, these errors would have been turned up and corrected almost immediately. We would not have been wasting time submitting comments to journals with lengthy peer review processes. The AGE issue is too important to be left to academic scientists. These UHI and globaltemperature record problems are relatively simple engineering issues. With proper use of established engineering principles and methods, they could be resolved very quickly. The assignment of rural/urban matters MORE the smaller the difference is. Take a simple example. If the UHI signal is .1C and you misplace some urban as rural and some rural as urban then it’s harder to pull that signal out. In reclassifying rural and urban, using better metadata, I’ve found that the mis indentifications tend to go both directions. That means adding some rural to the urban bin and adding some urban to the rural bin. Peter and I have been exchanging notes, but getting completely correct locations has been difficult even WITH the WMO asking all nations to update their position data. A big factor is the non-linear response. A rural settling experiences UHI too. Indeed, the largest increments in UHI effect occur during the initial population increases. This is one factor which confounds primitive partition analysis like the night-lights methodology or using the current population census. Yes, Dr. Spencer did an interesting study on that issue that is on his site. So every order of magnitude change in the population of a settlement increases the temperature by 0.73C. The trouble with that analysis is precisely this log population effect. For instance if all settlements have been growing at the same rate–say 1% per year. When you compare the trends of rural and urban stations they will be the same (about). This is Zeke’s result, but this is not the UHI phenomena from the literature. Indeed, its entirely unremarkable that rural and urban stations have the same trend if they have similar population growth rates. His work is basically non-responsive to the actual issue, although it does address a certain cargo-cult version of the UHI argument. Its useful to cut away distracting arguments, but its important to keep in mind that Zeke’s work does not contradict Oke’s finding of a UHI contamination to the trend. Oke wrote many papers after that study. log Population is a rather crude ax to swing at the problem but the best he had at the time. The study was limited and for the most part it’s recognized that the mechanism of UHI is crudely tied to population. For improved studies you can look at those that covered the US from 1900 to present (using population densities at 30 arc seconds.) You won’t find the log relationship. Similarly I looked at worldwide stations and could find no log relationship. Basically population is a proxy for UHI. It matters what the people do to the surface and where they do it. For example, in parts of the world where you have dense populations but the people do not build high structures, you have less UHI. ( UHI results from disruptions in the boundary layer cause by building height) In places where the city is built in forests the biggest factor is deforestation, not the actual population density. On population growth I compared sites that had no growth with sites that had high growth. For the period 1900 to 1940 I compared two sets of stations. Rural sites with no growth ( less than 15 people per sq km from start to finish) with those that went from rural to urban ( from 15 people per sq km to over 90 per sq km) The results did not indicate any significant UHI effect. So you didn’t consider then that 1:15 is an order of magnitude and 15:150 is an order of magnitude too? Or whether the population density was uniform or bunched? Focusing on small population density areas at all is a risk factor. So your results as summarized here are not convincing, but I encourage you to reply with a link giving fuller access to your data and methods. For instance, it would be better to take pairs of geographically similar cities of similar area where the population density around the station is ‘city-like’ i.e., approximately uniformly dense and well documented. the population densities numbers are less noisy. Could you frame your results in context? Yes Im aware of Roy’s work. i found it unconvincing. core dataset and the lack of QC on that data. he does with the info I passed on. If you would like to specify a hypothesis I can surely test it. growth from 1 person to 15? how about 0 to 15? The above does not cut it as a description of a proceedure. 1. geographically similar? Are you talking about topography or ground cover surrounding the site? 10s of kilometers. UHI effects are thought to extend at most 20km (for precipitation) so persistent wind direction would matter. 3. Uniformy dense? Again, density doesnt matter as much as building height and canopy cover in the city. see for example the portland study. 4. you also (oke 2002) want to know about the water use around the site. That’s harder to get but there are global maps of irrigation. With suitable definitions such a test would be possible. The paired approach ( cce was right about this) has more chance of showing the effect. I am aware of an extensive study that uses a paired approach in a very slick way, but you’ll have to wait to hear more about that. sorry. The base code to do anything you want is on my site. If you come up with an interesting test, I’ll code it up, or you can do it. Being impatient, I went to your website and attempted to download your releases. Your drop.io links do not work. The service has been discontinued. Regardless, what I was aiming to extract from *your* release is an X-Y scatter plot of trend in temperature vs trend in population. Various pingbacks at that location should also help you find posts that use other datasets for population. Overall, I think income tends to be a better proxy than population…see some of my latest posts. Thanks for that. I think I have the code now–now I’m just waiting for some R dependencies to recompile. Plotting the difference in trends vs. the difference in population trend for station pairs is an exciting step. I’m still hoping to take one step back through and plot for each station individually, the trend in temperature versus the growth-rate of population, and work with the statistics from there. I’m expecting the residual of a line-fit to that to be large, but I must admit I’m not comfortable planning further until I see how bad it is. It may well be necessary to work out a better proxy for predicting UHI–as others have mentioned here. DO you mean trend in population density? No for a couple of reasons. First, trend implies a linear-fit model. I don’t think the slope of density directly is the right independent variable; based on prior findings of a log dependence by Oke and Spencer, my first guess is that growth-rate is the more relevant proxy as that would correspond to the trend of the logarithm. Second, past work in this area indicates the horizon of the UHI effect is on the order of 10km. That means that not just the local density matters but a radius-dependent weighted integral of the density would be more relevant. But I also preferring a simple model to begin the investigation. So, I’d start with a constant weighting, i.e., population in that 10km area and compute the growth-rate rather than us the population density of the 1sqkm grid cell of the station. Note: this is not the same as using 10km grid cells! Of course you are correct that population is a mere proxy for the UHI effect. You asked to understand better what it means for a pair of cities to be geographically similar. Steve, what we are looking for are topographical not micro-site similarities. Mountain features, hills, valleys, bodies of water and surrounding land use. Conversely, Micro-site (ground cover) issues impose constant offsets to stations. They don’t affect the trend, although changing micro-site conditions could have an impact–I’m open to that issue, but I don’t think the metadata exists present to analyze it. You also ask a series of further questions. My concern, that you missed, is about homogeneity and noise in your proxies for UHI. Consider just a 1sqkm area. Having 15 people living in a village in one corner and the weather station in the other is different from a 1sqkm area where 15 people live in an industrial complex with a weather station in the middle or on the edge. Focusing attention on finding rural sites is problematic. There are significant concerns about the precision of the metadata. Urban areas pose different issues–particularly with station moves but have less noisy metadata for details such as population. You seem interested in a rural/urban binning methodology. An indicator variable (however derived) is not the right approach at this stage. The results are too skewed by the bin selection and number of stations in a well defined bin is likely to be small–this gets back to the metadata problem. The phenomena we’re looking for is a continuous, monotonic effect–although not necessarily linear. The place to start our analysis are, as I mentioned already, simple X-Y scatter plots of trend vs some proxy for UHI. You can look at model fitting later, first you need to get a basic feel for the data and the proxy. I suggest plotting trend versus population growth-rate as a starter. We can work on more sophisticated proxies later. As I mentioned, I looked at your site but found lots of broken drop.io links. Please direct me to a current version of your work, and we can start discussing how to pose the investigation of this sort of topic. Just to add some complicating factors, changes in the types of plants change the amount of respiration from vegetation. Having lived in a hot, dry location, the lawn grasses were first conventional high respiration grasses, but as development increased the water costs went up, with occasional watering bans. Almost everyone switched to low water use, drought tolerant grasses and landscaping. The net result would be that the plant respiration (a cooling factor) in the city grew until it was limited by the water supply, at which point it roughly flattened out. There is a similar issue with irrigation over time. Different crops require different amounts of water and have different respiration rates. More importantly, irrigation methods have changed to decrease the amount of water which evaporates before it reaches the ground. This doesn’t matter as much if you’re just looking at number of acres under irrigation, but irrigation water usage per se is a little more complicated to understand. You still have not defined what you mean. What constitutes a mountain? a hill? a valley. "You also ask a series of further questions. My concern, that you missed, is about homogeneity and noise in your proxies for UHI. Consider just a 1sqkm area. Having 15 people living in a village in one corner and the weather station in the other is different from a 1sqkm area where 15 people live in an industrial complex with a weather station in the middle or on the edge." 1. you say its different. on what empirical basis? 2. if its an industrial complex, then specify ISA as well. 4. is 1 sqkm too big, then how about 500 meters? But we might be able test your assumption that 15 people in a village is different than 15 people by an industrial center. What would your hypothesis be? how different? what effect size do you anticipate. on what basis? in all cases? "Focusing attention on finding rural sites is problematic. There are significant concerns about the precision of the metadata. " 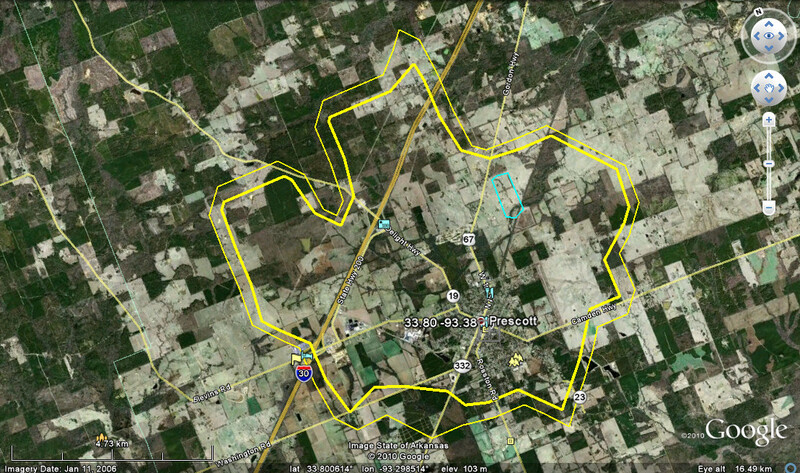 actually its getting better, if you care to take the time to survey all 7000 sites in google earth. To question the precision of the metadata one actually has to look at it and base that on an empirical investigation. I'm well aware of the precision issues since I've been looking at them for 6 months, along with others. So which metadata are you concerned about? "Urban areas pose different issues–particularly with station moves but have less noisy metadata for details such as population." actually not. the urban areas can have much noiser population data. This is due to the various ways they estimate population and whether you are talking about population at night or at mid day. I suspect you havent examined the various ways population density is estimated. "You seem interested in a rural/urban binning methodology. An indicator variable (however derived) is not the right approach at this stage. The results are too skewed by the bin selection and number of stations in a well defined bin is likely to be small–this gets back to the metadata problem." Actually, the results are not skewed by all bin criteria. After you try a few dozen, you will see that. You suggested a paired approach. So I think its a fair question to ask you how you define the pairs. "The phenomena we’re looking for is a continuous, monotonic effect–although not necessarily linear. The place to start our analysis are, as I mentioned already, simple X-Y scatter plots of trend vs some proxy for UHI. You can look at model fitting later, first you need to get a basic feel for the data and the proxy. I suggest plotting trend versus population growth-rate as a starter. " Done that. plotted trend versus all proxies for UHI. versus various binning strategies.done that and more. "As I mentioned, I looked at your site but found lots of broken drop.io links. Please direct me to a current version of your work, and we can start discussing how to pose the investigation of this sort of topic." The base code is in the drop box on the site ( not drop IO anymore) but I'm refactoring the whole lot as a OOP project and then I will do a package with vinettes. So, spend some time coming up with testable hypothesis. cause I really want to learn the R OOP stuff. I have only now had time to browse these comments, and, as the Peter O’Neill referred to here, I would like to leave a short note now explaining that I will not be contributing any detailed comments here on this topic at this time. I have submitted a detailed “proposal for a comment” on Hansen et al (2010) to Reviews of Geophysics, which is an “invitation only” journal, and requested an invitation to submit a comment based on that proposal. I do not wish to prejudice the chance of acceptance of that proposed comment by commenting at such length that might be taken to constitute prior publication elsewhere. Briefly, the proposed comment deals with these location errors and their possible impact on the Gistemp analysis, and in addition quantifies and/or graphs certain aspects of the analysis which in my opinion would be of interest to any reader of Hansen et al (2010) and which, again in my opinion, should not have been left vague or unquantified in that paper. While avoiding commenting at length for the reason above, I will nevertheless try to add some brief comments such as the one I am about to add in response to tty’s comment of Dec 27, 2010 at 10:04 AM, where such a brief comment may be of interest. OK, Steve. It sounds like I was basically right (however we express it, positive or negative). That your post just notes the change avec suspicion. Thank you for notifying me that “it changed”. I reserve judgment on Hansen, other than that. The work steve did on the code was instrumental to my understanding of what was going on in several areas. It’s best you not try to revise history. I hope that others spend some time on the unresolved issues here, I can’t right now. I wonder if there is adjusted data being adjusted again and again? I also hope somebody figures out what the global temperature trend is using unadjusted raw data from just rural stations. The reconstructions without adjustments don’t show much difference in the overall global trend. Recent satellite UHI studies have called into question whether the UHI adjustments are an order of magnitude too low. I.E. The UHI effect for Providence, Rhode Island during the summer was measured by satellite to be 12 degree C.
The 12 Deg UHI noted here is surface temperature not air temperature, so it will influence how warm it feels to be there, but not how much bias the thermometers show. Also, never forget to remember to mention the anomalization process, of looking only at trend differences after subtraction of ‘constant’ offset from baseline. Although it seems implicitly obvious that UHI would not be a constant over the period of the trend analysis, I think it is worthwhile to routinely include this aspect in your comments. Otherwise, perfectly reasonable insights can be categorically denigrated with a claim that ‘you don’t even understand anomalization ‘. RuhRoh: if you are addressing me, I don’t see your point. I was making a very technical point about the satellite measurements being surface temp, not air temp. Not sure how the anomalization process affects the UHI trend. If a city was a city in 1850 and didn’t grow, the UHI trend will be zero even though it is hotter than rural, and the anomalization process with properly account for that. The data teams like GISS and CRU seem intent on proving there is no UHI trend in growing cities rather than properly accounting for a trend. Too much hassle for them or too inconvenient, your pick, to do it right. If a city was a city in 1850 and didn’t grow, the UHI trend will be zero even though it is hotter than rural, and the anomalization process with properly account for that. Not so sure about that. Energy use would certainly have increased over time. Ultimately that energy will end up as heat added to the local environment. OTOH insulation improved over time too. In many cities energy sources changed from coal and wood -lots of heat up the chimney- to a lot of electricity – not so much heat up the chimney. Unless you assume air in never heated or cooled by the earth’s surface ( a very bad assumption), air temperatures a few feet off the ground would inevitably be influenced by surface temperatures. The nature, method, purpose, effect, documentation and archieving of these adjustments is surely a good topic for investigation by the new committee on the US House of Representatives, which it is understood will be established early in the new year. The idea of establishing engineering standards for changes in temperature records should be part of this investigation. It would be a great step forward if proponents of the various theories of climate could actually have a firm basis for knowledge of what the temperature is now and how it has varied in the past, at least since regular instrumental records commenced. And what is also required is a standing team in the form of an official commission dedicated to auditing the temperature data to ensure that the (hopefully soon to be) established standards are followed to the letter. The team should consist of a small group of engineers, statisticans and forensic accountants, whose members rotate, with a percentage retiring at regular periods. Then write to the new Science & Technology Committee like I did, stressing the need for a clean slate overhaul. As a scientist, if you carried out work 10 years ago, at the tax payers expense, and made predictions based on your work, would it be ethical to change your predictions to match the real outcomes? Not even pharmaceuticals can get away with that. So we should only accept a geocentric universe as this is what “scientists” first proposed. Or perhaps scientists should be true sceptics and change their views on research and analysis? However, surely the amount of re=writing in the US record since 2007 is worthy of comment. My comments can’t seem to keep clear of the moderation queue. Is it because I link to the prior comments to the post that I link? I do so because the threading procedure can distance neighboring comments from one another, as a thread develops. The link there is to the palmer talk at AGU. It seems that Palmer is advocating stochastic methodologies, and is highlighting weaknesses in deterministic modeling to make his sale. The GISS temperature analysis has been available for many years on the GISS Web site (http://www.giss.nasa.gov), including maps, graphs, and tables of the results. The analysis is updated monthly using several data sets compiled by other groups from measurements at meteorological stations and satellite measurements of ocean surface temperature. Ocean data in the presatellite era are based on measurements by ships and buoys. The computer program that integrates these data sets into a global analysis is freely available on the GISS Web site. DATA and CODE seems to be available? My guess is that it will be very hard to construct circumstances under which UHI will matter after data has been Menne-transformed. And that tests of the various night lights scenario on data after it has been Menne-transformed will not tell you very much. This is just a surmise as I haven’t waded through Menne code. (I requested it a number of years ago, but was unsuccessful until 2009.) It’s too bad that the Menne adjustment methodology wasn’t published in statistical literature where its properties might have been analysed by now. It’s a worthwhile topic still. Cannot be bothered to look at the code for over a year???? If the Menne adjustment were that important should you or your acolytes not have checked it? Steve: Digging into the Menne code is a large project and I have other interests. It is not my personal responsibility to verify the work of every climate scientist in the world. The issue with CRU is their handling (or ignoring) of UHI. I have never suggested that even CRU’s code was anything other than a trivial averaging or that people should expect that even CRU screwed up such a simple exercise. Quite the contrary. I suggested that CRU’s secrecy was because they were embarrassed to show that they did no due diligence on station histories. why didn’t you do it FOR him since you seem all fired up about it?? Why didn’t Tamino or any of the guys at RC do a decent job of analyzing it for us to take away one more of our continuing whines about the oh so pristine and perfect GISS?? How about Science of Doom?? Why hasn’t HE done an analysis of it for us?? How many of those technical types are there that are continuously sniping at Steve who are capable of doing the analysis and haven’t done it?? Or, maybe only a couple of them really ARE able to do it and they don’t WANT it done cause all it will do is open up the can of worms about justification for parameter selections and other issues like Steig’s Antarctic paper?? Come on Ford, get to work getting out that analysis for us so we can find problems with it!!! The code is published – is it not your “turn” to provide the critique to be pulled apart by the other side? Surely this is the province of an auditor (which I am not). Volunteer work is well, voluntary. You say – Digging into the Menne code is a large project and I have other interests. It is not my personal responsibility to verify the work of every climate scientist in the world. You therefore have no right to “surmise” and “guess” that it is wrong unless you have the evidence. I find it strange that you made so much noise about lack of data and “code”, whipping your followers into frothy mouth frenzy, and then when it becomes available you (and they) totally ignore it. Why? Check EM Smith’s site, I’m sure you know where it is. Post your questions there. He’s done a pretty thorough deconstruction. Oh, and there’s something dribbling down your chin. No right to surmise and guess? Really? When someone has looked into these issues for a long time and notices a big change, they have a reason for the guess. For example, many analyses at CA have shown that the homogenizations tend to adjust good stations using bad stations, especially in the ROW but even in the USA. So it is a pretty good guess. It is a “heads up” if anyone has the time to investigate. Anyone. Every investigation into what and how begins with a surmise. It’s what comes after that which matters. Absolutely, but “I wonder if it could be this?” is not a surmise or guess. “I surmise it’s this” is very different than “I wonder if…” A surmise or guess is not a wondering or an hypothesis. It’s an inference without evidence. I’d rephrase this just a little: What is the point of this woolley statement other than to pour yet more well-deserved scorn on UEA. Re: thefordprefect (Dec 26 21:47), interesting, isn’t it, the difference in attitude to this and to Ross’ efforts. For Ross’ efforts, even the hint that there may be a mistake means he’s WRONG unless he shows otherwise, when he’s still WRONG – guess after guess until he grows tired of defending, at which time he’s been “proven” wrong. For The Team though, it’s RIGHT until you can not only PROVE IT, but show that “it matters” to the result, by which time they have “moved on” and “one mistake” doesn’t “matter” because there are so many other papers “proving” the result. Yeah, I know it sounds like sour grapes or a conspiracy theory or something – yet I would urge you (and/or anyone else)to review both issues dispassionately and show me where the above is wrong. TFP: Please note that the quote is misleading. Sure, there is a trivial inclusion of data from sats. It’s blended and merged into the small amount of data from ships, bouys, etc. that are all concocted together into the UEA CRU SST data set. By the CRU crew. THAT can OPTIONALLY be added to the GISS “land only” analysis as a last step. The quote makes it sounds like they go from first sources to make their own analysis of SSTs. They don’t. It’s just a CRU “glue on”. So all the “Harry Readme” and Climategate “issues” adhere to the GIStemp SSTs. Not true. Neither CRU, nor ‘Harry’ do anything with SSTs. The HadSST products come from the the UK Met Office, and in any case GISS uses the Reynolds (NOAA) satellite product for modern SSTs. The problems with H2010 also run in other directions. corrections have been sent to GISS, we will see if they decide to publish corrections. to this as I requested. we will see. on Menne’s code. I’ve had it for some time but haven’t looked into it yet. Lot’s more to do before that. Are you able to convey ‘your’ copy of the ‘Menne’ code to interested analysts? What are the constraints under which you obtained it? A Unix-type platform with the Fortran77 compiler is required to run the code. Virtualised Unix platforms are available for free download (eg. VirtualBox). I ran into a few minor difficulties compiling a running, but posted the resolutions for those. I have not been able to reproduce the official F52 dataset yet, since I need to do more digging into the settings used. Nice of you to kick the tyres on that software. What are your impressions regarding clarity and portability of the coding of the PHA algorithm? Do you see potential sensitivity to the compiler version? Do you have an opinion about how readily it might be abstracted or translated into a modern statistics language program for exploration of its properties and behaviours? You note the inevitable issues with the input files, but I am more interested in the core implementation. Thanks for your efforts and comments. As you mention, I did not get deep into the code. I’ve been working on my UHI analysis, which led to a brief diversion into the PHA, and I only wanted to attempt to re-create the F52 dataset using the software if possible. My post was basically just trying to supplement/correct a few parts of the quickstart guide included with the PHA, so that in the future people didn’t run into the same difficulties that I did. I commend your efforts to clarify the situation. I’m no statistician, but something seems extremely fishy to homogenize part of a data set separately from the other part. I dropped all of my computer science classes nearly 40 years ago and rarely regretted it. But this is one of those rare moments. I see that Fortran ‘routines’ can be ‘called’ within the popular program R.
The trick is to find a person with a foot in each world, who could do a decent job of packaging up the PHA fortran into an R ‘subroutine’. This might facilitate the searchlight of statistical crosschecks into the unique PHA technique. The idea of separating the temperature record into Tmax and Tmin and running the PHA homogenizer on them independently, before *averaging* them together, just seems so wrong to me. Like the old error code burned into my psyche; “mixed-mode arithmetic”. Have you been able to reproduce the official F52 dataset by running the PHA? 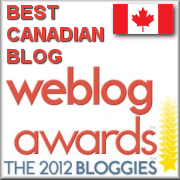 Do you know of anybody in the blogosphere that has done so? I sent a note to the default contact address (ncdc dot ushcn at noaa dot gov) a few weeks ago with some questions and a notification of a few minor bugs, but for all I know that could’ve ended up in their spam filter. I still can try it with a few different settings to see what I get, but I’m afraid if they have different HIS files I won’t be able to reproduce it no matter what. At one point when I thought I had some free time, I sent an email question to Menne and got a courteous reply within a week. The email address was on one of his papers. I have the impression he would be willing to support bona fide efforts to run the package. I remember Cheifio comments on brittleness of input files, but not sure if he was working with V1 or V2. Thanks for your comments and efforts. Thanks, I sent Menne over an e-mail. 0.5 C correction to the data is a good fraction of the change over the last century. This is like performing eye surgery with a backhoe. I have been working on the first difference method and have read a stack of papers on adjustments, including the work of Menne. I find that with few exceptions they discuss various methods in general terms without ever saying exactly what was done in the real (eg NCDC or GISS data) cases. They will point to a whole bunch of cases like missing values, station moves, instrument changes, etc and what one CAN DO to fix them, but never say what they DID do. Also, assertions are made about various factors (effect of TOBS changes or error propogation) with no documentation. So, they will assert that the methods are described in the publications, and they are, sort of, but not in the sense that one can tell what was actually done. I also think Steve is right that using the Menne homogeneity adjustment smears signal and should not be used before trying to detect UHI, like it appears Hansen did. Jeff Id convinced me that although FDM solves one problem, it just creates another when the climate signal is contaminated with weather and/or instrumental noise. As noted in the comments on that thread, I now think that some variant of the regression method advocated by Tamino and RomanM is far preferable. In any event, Happy New Year to one and all! One should note that UHI will tend to make growing cities (and thermometers located there) warmer over time. Adjusting for this will COOL the present and WARM the past, not the other way around. This is another thing that raises suspicion with the GISS adjustments. The magnitude of adjustments vs what one might expect a priori is TWICE what Steve shows in the graph above due to the opposite sign from expected. The counter argument being that Tobs changes and instrumentation changes dominate and justify skewing the correction to cool the past and warm the present. Is the Menne PHA data-smearing technique used in combination with TOBS and Instrumentation adjustments? I had the impression that it replaced ‘ad hoc’ adjustments with a fully automatic procedure, that had no reliance on the inevitably spotty metadata. BTW, I greatly enjoyed your adroit inclusion of the words that clarify the warming UHI trend of growing cities. My understanding is that TOBS adjustment is done first, using the metadata, and then the PHA is run. The instrumentation adjustments are supposed to be made automatically by the PHA, which takes the metadata as input for “known changepoints”. I’d be careful about believing what you read about the code. Apparently, Hansen’s using an automated setup, with corrections globbed on at various stages. The official descriptions of what is being done has been claimed on another blog to not accurately depict what the code is actually doing in detail. Even without the claim, everyone has seen the CRU code quality disclosed during Climategate. Since these NASA guys aren’t statisticians or programmers, nominal expectation should be comparable code quality to CRU (although apparently it may be worse). Or maybe we need to learn this all over again? 1) The TOB and homogeneity adjustments within USHCNv2 are the reason. The other post 2007 changes were minor. November 13, 2009: NOAA is no longer updating the original version of the USHCN data; it ended in May 2007. The new version 2 currently extends to July 2009. Starting today, these newer data will be used in our analysis. Documentation and programs will be updated correspondingly. on the problem. I would second any recommendation of his work. Cce that was an interesting post, however you seem to have missed an option: it is possible to accept the need for TOB and inhomogeneity adjustments but to be unconvinced of the validity of the actual adjustments made, particularly if there are documentation issues relating to the method and purpose of the adjustments. This may be why Zeke’s impressive work seems so counter-intuitive to those of us who note dramatic changes between air temperatures in urban and rural areas, and muse on the very rapid growth in population and energy use all over the world. I am reminded that the ivory tower approach is always something that can be readily obtained and then massaged from the tower. If the hand wave to validity does the trick, then it is used. Here I am not going to discuss the errors that these approaches can cause, but merely want to point to what the Watts team found through a lot of diligence and hard work versus the tower approach. The Watts evalution shows that each station, no matter where located, can have its own micro climate problems. Hansen wants to use population for a UHI adjustment for GISS while GHCN and USHCN use only rural stations for a basis for all their station data. That’s all well and good as long as you do not worry about the problems that the Watts team found with individual stations. What Menne et al published about the Watts effort results and how it might affect the US temperature records was totally inadequate as I have pointed out previously. Those who used population to determine UHI depended on Grumps. Grumps is full of holes. Riyadh,Saudi Arabia population 4.8 million was listed as ‘rural’ in Grumps along with Mosul, Iraq and Basra, Iraq and those were just the cities names that ‘popped out’ as rural using my Mark 8 Eyeball data analyzer. As is usual in many US based data products, they assumed the rest of the world works like the US. Lot’s of places don’t keep records at the city level or have formal city boundaries, so the population density of Riyadh ends being 4/km2 because it includes huge amount of uninhabited desert. The nightlights suffer from the same problem, a billion people live in Africa yet nightlights shows almost all of Africa as rural when there are clearly many massive cities in Africa. Same goes for North Korea. Poor countries don’t leave the lights on at night. Population data isn’t necessarily very specific. I’ll take ‘King County Washington’ as an example. We have population Densities of all of the cities(incorporated areas). These are reflected accurately in Grump. What is left is those that live in ‘unincorporated King County’. This is simply the population of unincorporated King County divided by the sq miles of unincorporated King County. Unincorporated King Country includes a significant areas that are unnihabited. I live in unincorporated King County, the last time I visited GRUMPS where I live is considered by Grumps to be rural. I can assure you we are packed in like sardines and are in no way rural and haven’t been rural since the 1970’s. habited with a really large amount of uninhabited. If we go to a country like Iraq. Iraq is divided into 104 administrative districts. Population figures are kept at the administrative district level. Baghdad evaluates correctly as ‘Urban’. The administrative districts that contain the cities of Mosul, Ramadi and Basra include significant portions of ‘uninhabited’ desert, the administrative district as a whole evaluates as ‘rural’. Grumps reports Mosul,Ramadi and Basra as ‘rural’. The same goes for most of the cities in Saudi Arabia. Here’s the Grump mapping tool. Try to find Riyadh, Saudia Arabia or Ramadi,Iraq with it. The Urban Population of primary cities(secondary cities not included) in Sub Saharan Africa has gone from 88 million in 1983 to 237 million in 2003 according to Table A1, Page 70 of this world bank report. Odienné, Cote d’Ivoire, GISS has a population of less then 10,000 and a quick google search turns up a population of 50,000. If there is a place in the world that should have a UHI signal it is Africa. But available population data sets are inadequate to pinpoint population density with any degree of accuracy and as Africa is for the most part ‘electrically challenged’ nightlights don’t work either. you can help by listing a GHCN site that has the wrong population density. I’ve posted the coordinates, the various versions of nightlights, the various versions of population densities. It does little good to point out that grump or any other product has errors in your back yard. GHCN doesnt have a station in your back yard. It does do good if you look at the actual sites and the actual figures and audit THEM. Those of us who have been working with the data ALREADY KNOW about the issues with it. What we need is more attention to the actual details at the actual sites. is one used 50000, one would classify it as Urban. if 200K is the real number, its still urban. Or … the UHI could actually be measured instead of “modelled” or “proxied”. Science could actually be attempted instead of avoided. Actually it is being measured in several ways and several places. Those measurements allow us to understand ( model) the phenomena. Modelling involves taking observations and measurements and reducing them to numerical “laws” or systems of “laws”. Equations. Collections of equations are models. Consequently I am in a permanent state of annoyance WRT this topic. Similarly with the stupid arguments about airports. Are you saying that a forest, grassland, plowed field, village which changes into a forest, grassland, plowed field, village , urban center, airport… will all give the same result for a trend over 100 years IF there were reasonable quality measurements over the period?? Steven mentions above that if you remove the stations located at airports, the trend remains the same. This seems to be a reasonable test to determine if airports are biasing the temperature record. If there is a more in-depth analysis that contradicts this finding, I don’t think he would consider it to be a “stupid argument”. However, any unsubstantiated claim that merely states that airports bias the record because it seems like they should, would probably fall under this “stupid arguments” category. That could also be due to most of the stations, including the airports being comtanimated with UHI or other problems. It in no way proves that the trend is Global. We have no stations except the few in Arctic and Antarctic that could in any way be considered to NOT be contaminated with Anthro effects. I always ask why they spent a lot of time determining alledgedly pristine sites to measure CO2 without Anthro contamination, BUT, we make little effort to site temp measurement where it MIGHT be considered unaffected!!! I agree that this is possible, and any such analysis showing this I would put under the more “in-depth”/”not-stupid” category mentioned above. However, if this is indeed the case, it seems silly to focus specifically on airports as being the “bad guys” WRT biasing the temperature record. Not saying this is what you’ve done, but perhaps the focus on airports is what Steven means by the “stupid argument”. If we are able to quantify a UHI effect and reconstruct the temperature trend without it, maybe THEN it will show a divergence between the airport trend and the non-airport trend. Is there not a couple of magazines/institutes/societies of statisticians willing to review the various Hansen adjustments and comment with a peer-reviewed paper on the appropriateness and warming bias/no bias aspect of their adjustments? All the data is public, yet there is such a huge gap in what Hansen does and what is intuitively ratiional. Should there not be an independent luke-warmer to pass STATISTICAL judgement? The problem for Hansen is that he has created for himself an apparent conflict-of-interests. He’s a scientist. But he’s also an activist. His position on CAGW is well documented. He has made it his life’s work to promote awareness of CAGW and fight warming. But he also runs GISS, which (under Hansen’s stewardship) has taken upon itself the task of studying the Earth’s climate. Given this, does Hansen have any less incentive to shape-the-facts or bend-the-truth about climate change than say, “big oil?” Please note, I am not accusing Hansen of any malfeasance. I’m just pointing out that its human nature to question any findings when they so clearly benefit the finder. Hansen has only himself to blame if people are hesitant to give him the benefit of the doubt. Rather than being an objective, detached, student of climate, Hansen has shown himself to be a passionate defender of the planet. His science could be spot on, but his passion makes people leary. I can agree with you right up to the point when Hansen adjusted the original data and then over wrote the original data with his adjusted data. He did this not once, but each time he felt that he needed a new adjustment. It is true that once this was known, certain groups began to archive GISS data so that we have data in its original form before all but the earliest adjustments. If a doctor discovered a cure for currently lethal medical condition, would you not expect him to promote his discovery? If a journalist discovered a mega miscarriage of justice, would you not expect him to campaign to have it overturned? I really don’t understand why a scientist who acts on his findings is viewed with such suspicion. It is all a matter of credibility. If one’s actions are viewed as simple partisan rangling or self-promoting publicity stunts, the unconvinced generally remain unconvinced. This is well-recognized among professional organizations, including medical ones. Of course, Louise – if they are real. It’s probably good that others were given a chance to replicate and/or further probe “cold fusion” and eugenics before governments squandered their industrial and personal assets in pursuit of same. Where you and I differ is in the amount of rigor applied to the findings. I’ve been around long enough to have seen many pupedreams and scams, and I fear this is one of them. What about John Snow – the chap that discovered that Cholera is transmitted through infected water? He physically removed the handle from the water pump that he believed was the source of the infection. He wasn’t an epidemiologist but a physician. Epidemiology was a new science back then. Perhaps Hansen feels as strongly as Dr Snow. As it happens, the handle was replaced because the authorities didn’t believe him but luckily the outbreak had dwindled by then anyway. When you have a testable hypothesis, and provide the data and methods used to support your theory, then sure. But when you perform secret science, letting only a select few have access, then we must be suspect. Newborns do not respond well to anesthesia. There were some observation made that newborns in painful situations do not react specifically to the pain. Thus an hypothesis was born to the effect that newborns do not feel pain in the degree that other humans do and importantly do not need anesthesia in operations. Instead they would just have their muscles paralyzed with curare. Now a young doctor at Oxford doubted this theory and feared that newborns were being subject to lengthy and invasive operations without adequate pain management. he investigated and found that these newborns had elevated cortisol ( the stress hormone) which indicated that they had felt pain during their operations. This was resisted strongly by surgeons and was not accepted for many years. One surgeon said that he had operated in the conventional way for 30 years and would retire if he felt that he had been inflicting pain. Now we have an example of doctors passionately holding incompatible views. Surgeons believed that they were preventing severe complications from anesthesia. One doctor felt that they were inflicting incredible pain by their practice. Actually, no I wouldn’t – at least, not publicly. I’d expect him to offer such treatment to selected patients as “experimental” and collect sufficient data to persuade the appropriate people that a full trial of that treatment was worthwhile. Further, I’d expect that such a trial would be epidemilogically sound and independant of any self-interested parties – or if it was not possible to completely eliminate self-interested parties, then to at least ensure that there was a balance of “believers” and “deniers” used for the evaluation. So how does that process compare to AGW? AGW fares badly, I fear. The Team has certainly collected sufficient data to warrant a careful and thorough investigation. However, as SM and others have shown, there has hardly been what I would descibe as “epidemilogically sound and independant or balanced” (as above) evaluation of a wider “trial” – I suspect that this is in part due to the (self-admitted) lack of statistical expertise used in the “evidence” and the evaluation of that evidence, and in part because the proponents have become politically active on the matter, which – alas! – tends to result in entrenched and polarised views rather than the “letting the data take you where it may” approach that characterises good science. Staying on the medical analogy, it seems to me that it is rather like the surgeon and the new treatment – if it is her own, she will be more inclined to suggest that “I’ve used this treatment on a number of patients and I don’t need any epidemilogical studies – I know it helps!”, while it if it’s not hers, she is more likely to say “what does the epidemilogy say?”. And in the case of AGW, it certainly seems to me that there are way too many people prepared to accept the word of the originators and followers of the theory, and that the above mentioned politicisation of the science prevents these very same originators and followers from even listening to reasoned voices asking for thorough, open and independant examination of every aspect of the theory, let alone admitting that there may be the odd mistake in it (as there inevitably must be – at least at first). Finally, I would suggest to you that all this is hardly the fault of the The Team – either individually or collectively. After all, for the vast majority of sciences (and in this, medicine is certainly one exception) the results do not heavily – if at all – impact on peoples lives and livelyhoods, and so they are not used to the level of rigour required under such circumstances. And neither are they required to follow the (medical) maxim of “First, do no harm…”. Where trillions of dollars of public money and billions of peoples lives are in the balance, extremely high standards need to be met, and I do not feel that such standards are even approached (as yet) in the case for action on AGW. It seems to me that a large part of the cognitive dissonance with the AGWers is their eye-popping combination of appeal to authority (their own re climate) combined with their simultaneous rejection of authority (statistical expertise). They claim that all critiques must be peer-reviewed to have any scientific value, then insist that such peer review must only happen in their own journals, even if the core scientific elements (statistical methodology) are outside their area of world-class expertize, which is clearly the case. So context, as almost always, raises its ugly head once again. . . what really is the relevant “authority” one ought to be appealing to? Climate or statistics? If statistically novel solutions are being applied, or at least applied in novel ways, then why isn’t statistics the really relevant authority to be convincing of their appropriateness? That is one reason there has been a call for a new journal, “The Journal of Statistical Climatology”, or some such name. I’m sure that there is some university, known for it’s statistics dept, that would sponsor it. Since there are so few climate scientists, and they may not be up-to-date on the latest statistical methodology, then let someone else check your work. Well there you go. We can use mutiple indexes for population, and in fact debate what mix leads to the right answer, when population might not be the issue. Yet it sure sounds like somebody did a lot of work to “validate” an adjustment, or lack thereof, for non-climate factors – and avoided actually doing any field work to determine what the real factors might be. Also do not blame Hansen and Jones for putting out these products, even when admitting that they have done things on the cheap and without out a lot of effort or due dilligence. The real problem is that so many climate scientist are willing to accept the products, or perhaps more to the point, the results of these products, in a very non-questioning manner. The biggest issue, and one of which I have heard Judith Curry complain, is the knowing much better the uncertainty in temperature trends which arise from the data and infilling required for the empty spatial and temporal spaces as we go back in time. Industry loves to do things on the cheap and without a lot of effort, as long as the due diligence is there – I’m all for it. We know the due diligence wasn’t there. There are three main features to the post 2007 adjustments. 1. Very large neg. adj end of 19th c.
3. Steady upwards trend post war. One of the problems of attributing GW to CO2 is that there were two roughly equal warming trends in 20th c. in periods with very different increases in CO2. This makes it hard to say CO2 was responsible for both. Now if someone was a self-declared activist, a major political proponent of AWG caused by CO2 and if this someone, in a position of responsibility over a major temperature record wanted to make the temperature record fit more closely to CO2 rise he is blaming for GW , what sort of adjustment would he need to make to the record to bolster his case? If someone wanted to continue the “hottest year ever” commentary when global temperatures were slightly less than in recent years what sort of adjustment would he need to make to the record to continue this claim? If this someone wished to strengthen the argument for continued global warming since 1850 what sort of adjustment would he need to make to the record to bolster his case? I think I can see a trend in the data. If the adjusted data/methodology has not been published and peer reviewed, how can anyone place any trust in the results? Further, how can any trust be placed in any published work that rests on the adjusted data? Until the adjusted data is peer reviewed it might simply be a case of garbage in/garbage out. The data has been peer reviewed. The GISTEMP algorithm that constructs the time series, anomaly maps, and trends has been peer reviewed. At least five amatuer analyses, including those done by “skeptics” and “lukewarmers” find similar results to GISTEMP, HadCRUT and the rest. More seriously though, note that these three links all refer to USHCN, while it is the quality of the GHCN metadata for locations outside North America which is questionable. As cce at least seems to agree that the data should be subject to peer review, it would perhaps be more appropriate to offer those wonderful and unrepeatable investment offers to the peer reviewers. If you follow this link and search for my name (I use my real name both here and there, and for that matter anywhere else I have commented) you will see that I have been acting properly and notifying Dr Hansen’s team of errors when I have found them, although I could add the comment that some other updates there without my name also arose following my submissions. I first warned Dr Ruedy more than a year ago, before the change to global station classification by nightlights, that location errors in the GHCN station inventory might be problematic, although at that time I had not realised that such errors were as numerous or as gross as subsequent investigation showed them to be. When I saw that the change to nightlights classification had been implemented I spent a few minutes (all it requires to identify a substantial list of errors, using any mapping program which will place pushpins at a list of latitude/longitude pairs) examining the station inventory, and sent that list of errors to Dr Ruedy. That list belatedly prompted the September 10, 2010 update, but only three of the “top” errors in the list, involving complete misidentification of the relevant stations, were addressed. The remaining location errors in that list, presumably cases where the relevant station was at least correctly identified, and the very likely existence of many more such errors as I had made clear that I had examined only a small fraction of the station inventory, remained and still remain unaddressed and undisclosed. Removing three stations may well permit the statement that [the] “effect of this change on the estimates presented on this web site is well with the margin of error of those estimates”. Making a similar statement regarding the effect of correcting location errors, where the number of stations requiring such correction is orders (plural) of magnitude greater, might cause even the most uncritical observer to raise and eyebrow and politely ask for some justification. I’ve just noticed that for some reason which I have not been able to figure out, my user name, oneillp, rather than my full name, Peter O’Neill, appears on this comment, although my full name did appear on my two previous comments on this post. As I pointed out in this comment that I use my real name here and elsewhere, I am adding this “footnote” to the comment now to ensure that my real name is associated with it. Go to your wordpress acount profile and change it in your: “Display name publicly as” setting. Thanks – I had just the defaults. No one said anything about “full vindication of the quality of metadata.” Contrary to the assertions above, the data and methodology has been peer reviewed. Note that this post is about GISTEMP’s analysis of the US48 temperature data. Note that the quality of GHCN metadata has nothing to do with the differences between USHCNv1 and USHCNv2 and the subsequent changes to GISTEMP’s output that McIntyre just noticed. There is no assertion above that the data and methodology have not been peer reviewed. There is a clear suggestion that if such peer review extended to the [GHCN station inventory as modified by Hansen et al by addition of nightlight values] metadata relied on in Hansen et al (2010), such peer review was clearly inadequate. I do not think that the AGU has any credible alternative to publication of a comment addressing shortcomings which were not addressed during peer review, and I modestly hope that comment will be the one I have proposed. I fully expect that peer review of such a comment will be rigorous, and believe this to be entirely appropriate. A rigorous peer review of Hansen et al (2010) might have obviated the need for such a comment. For the record, I would also like to make clear that my correspondence with Dr Ruedy on the subject of the metadata gives me no reason to suspect any intention to deceive, but rather suggests an approach to data quality on the part of Hansen et al that I, from an engineering background, find unacceptable. Kenneth Fritsch describes the problem rather well earlier in these comments: “… do not blame Hansen and Jones for putting out these products, even when admitting that they have done things on the cheap and without out a lot of effort or due dilligence. The real problem is that so many climate scientist are willing to accept the products, or perhaps more to the point, the results of these products, in a very non-questioning manner”. From an engineering background I cannot concur with the “do not blame”, as absence of that due diligence is unacceptable, but Hansen et al seem to have simply accepted the GHCN metadata without question, even when extending it in a way not envisaged by the original compilers of that metadata. Note that this post is about GISTEMP’s analysis of the US48 temperature data. have extended discussion to the GISTEMP analysis globally. Hardly surprising, since for those of us in the “rest of the world” the US48 analysis, covering I believe only 2% of the earth’s surface, is little more than an interesting case study involving an area where the data and metadata can be regarded as of higher quality than generally found in many locations in the rest of the world. Note that the quality of GHCN metadata has nothing to do with the differences between USHCNv1 and USHCNv2 and the subsequent changes to GISTEMP’s output that McIntyre just noticed. This is not correct. While the GHCN metadata has nothing to do with the differences between USHCNv1 and USHCNv2, the same does not extend to “the subsequent changes to GISTEMP’s output”. The GHCN metadata is used in Steps 2 (splitting into zonal sections and homogeneization) and 3 (gridding and computation of zonal means) of the GISTEMP analysis for both GHCN and USHCN stations, and any location errors therein will affect the output. I would recommend putting some of your efforts into studying the actual GISTEMP code. The US48 analysis uses the same basic techniques as the global analysis (and they are both documented in the same papers). If Hansen was trying to cook the books, it would show up in the global analysis compared to the others. 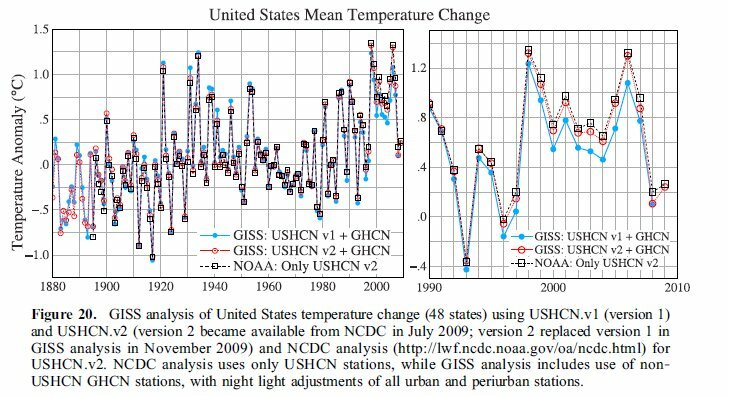 The reason that the US48 temps increased was due to the swapping of USHCNv1 for USHCNv2, not because Hansen was nefariously changing the algorithm to pump up warming. Which means that GHCN metadata has nothing to do with the differences that McIntyre just discovered, because the GHCN metadata that GISTEMP uses hasn’t changed, and USHCN has. That will change when GISTEMP inevitably switches to GHCNv3. That is using the beta ghcnv3, without the more extensive USHCN for US48, and no SCAR. quoting me, then mixed my posting with another in what followed. Thank you for posting the above list of links. It makes researching this a lot easier and less time consuming. Well, it may have been peer reviewed but a couple reviews by guys in their pajamas found some notable errors. 1. Hansen’s claim that station location data is good to 1km is demonstrabley false. He’s been alerted to this by Peter Oneill and I’ve posted on it repeatedly. 2. EVEN IF the station data were good to 1km the nightlights data IS NOT accurate to 1km. The registration errors average over 1km and can approach 2km per the descriptions given by the scientists who assembled the data. 3. The nightlights data used by Hansen IS NOT SUITABLE FOR ANALYSIS and has been deprecated by the agency that produced it. I would hesitate to publish their mail to me stating this. I suggested that they contact Hansen and advise him of the unsuitablity of his data. Given that Hansen decided to extend nightlights to the rest of the world you would think he and the reviewers would do a day of dilengence to discover what it took Peter and I to discover in a few hours. I wouldn’t be surprised if GISTEMP is modified to incorporate those findings. September 10, 2010: Three more stations were removed in our cleaning step: Zaragoza Airport (misidentified as Tenkodogo in the inventory file), Albacete and Sintra/Granja; there seems to be a potential mismatch between station ID and station name and location. The effect of this change on the estimates presented on this web site is well with the margin of error of those estimates. which addressed three of the errors I had notified, without addressing or acknowledging the metadata problem in respect of incorrect locations for stations where there were no such mismatches (nor for that matter addressing other stations which do have similar mismatch problems, but which I had not listed). It seems to me that GISS has had adequate time to acknowledge and start addressing this issue. It will clearly take time and resources to correct the station inventory errors, but this is not a reason to act as if such errors do not exist, particularly in light of publication of a paper where a substantial analysis draws heavily on this metadata. Meilleurs voeux Mr. McIntyre,ainsi qu’à vos proches,et merci encore de vos travaux. I am somewhat perturbed by Hansen’s comment in your piece that UHI is a myth. Some years ago, I read Michael Crichton’s “State of Fear”. Early on in the book he published temperature records of both New York City, and Albany. Now, I live in the UK, but I know two things about these cities. Firstly, geographically, they are not far apart in terms of distance or latitude. Secondly, over the 20th century, New York has grown much further and much faster than Albany. It comes as no surprise therefore that the warming graph for New York is much steeper than that for Albany, which is just above horizontal. Now,as a trained card carrying chemist, I know that does not prove UHI, but it does somewhat challenge UHI deniers to come up with a pretty good alternative to be credible. The aggregated graph above shows a colossal change in methodology. But I wonder what a map of the ‘adjustments’ (through time) would look like… When compared to Night Lights, topography, etc. Its too bad these data aren’t easily GIS-enabled. I have been looking at the USHCN temperatures from a biological stand point as many organisms are more affected by the maximum temperatures. This led to comparing raw vs Menne adjusted temps for both max and minimums. IF you compare the maximums,most often the adjustments are slight. Some times the max adjustments even create a smaller trend or even a cooling trend. But then try to predict the adjustments for the minimums, and they are befuddling if not scandalous. For example I was just looking at Death Vally’s temps: http://cdiac.ornl.gov/cgi-bin/broker?_PROGRAM=prog.climsite_monthly.sas&_SERVICE=default&id=042319#gplot_meanclim_mon_yr Look at the max raw and adjusted and there is very little change and the range of temps stays with 4 degrees for both with a small adjustment around 1920-1930. So would you expect a similar adjustment for minimums. 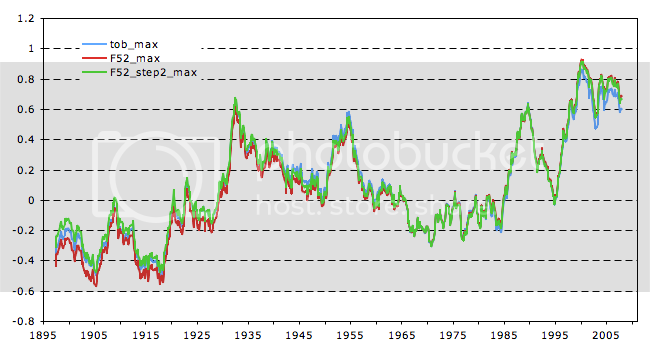 But the adjusted drop the 1910 -1940 by up to 5 degrees to make a steep upward trend. For adjustments due to thermometer changes or location changes one would expect relatively close agreement between adjustments to minimum and maximums. However that is never the case. The rationale for minimums adjustments is very different, and typically make a more steep trend. And the average temperature trends are driven by these minimum temperature. Most raw maximum trends are the same as most tree ring trends:they recorded a declining trend in temperature. The increasing trend for minimums is often different and always adjusted to show a dramatic increase. NO wonder the have a divergence problem. It is driven by the divergence of adjusted minimums. And most trees are not very active when minimums are recorded and adjusted. The nuts and bolts of the Menne adjustments very much need to be examined in full light. Intensification of UHI and other non-climatic environmental changes that affect station temperatures take place over decades and centuries. This introduces spurious low-frequency components into the time- series that do NOT cancel out over the long run. These changes are largely responsible for the produce “observed trend.” To this physical signal corruption, which becomes particularly onerous in regions where no rural stations are available, USHCN has added via Ver.2 its own trend-manipulating adjustments. We no longer have real data that is the product of direct measurement by instruments. Welcome to the computer-generated world of virtual reality. The saving grace is that UHI continues as a process. It is not lost in the sands of time. There are current sites where the main elements of UHI can be teased out and some causes, coefficients and variances put onto test cases. And then more, until a sharper picture emerges. Then if one wishes to go back in time, the main factors have some quantitative aspects and the assumptions are fewer. Starting globally with reams of data, looking for correlations and causes, is another way; but I think the best result is when the two ways are used. There is a lack of good data on current test cases; too few cases have been publicised. Overall, the first need is error correction of collected data. The next is removal of spurious adjustments. Without these, one is not able to correlate properly, such as with population factors. Based on extensive, incisive comparisons of scores of adjacent urban-rural record-pairs, I’m not as optimistic as you are that a general analytic formulation of UHI effects can be reliably “teased out” of the records. The discrepancies are much too station-specific for that. Population figures and night-light intensities prove inadequate for modelling actual discrepancies. That’s why I take the position that urban records are individually unsuitable for climatic analysis. IMO, reasonable UHI adjustments can be made only in the statistical aggregate and only when we have an abundance of “rural” records uncorrupted by land-use changes. Sadly, in much of the world urban records is all that we have. The upshot is that we know far less about the historical course of temperatures in many large regions than crank-turning compilers of “global anomalies” care to admit. Australia and the USA are the only countries where reasonably uncorrupted records are available in sufficient abundance to form close estimates. But they keep on fudging the data base even there. Agree with your comments. But there is hope that the overall population density differences between USA and Aust can help (20:1). Aust has quite a few truly rural, pristine sites that should allow certain deductions that are harder in the USA. There is also hope that some test cases can put limits on what to expect from global studies and so be used as a quality filter for findings. Sorry to tell you, but your name has been thoroughly expunged from the update page. They’d rather waste time editing people off the page after a cameo appearance than have outsiders getting long term credit for correcting them. Steve’s name didn’t stay there more than a month or two when he pointed out their use of an incorrect dataset back in 2007. Here is why they don’t mention the changes caused by using the night lights. Night light caused station changes compared to the original population figures. There are 1455 stations with 100 or more years of data. By night lights 982/1455 are adjusted. 755/1455 are rural by population. 370/755 are now adjusted. I don’t see their UHI adjustment scheme having any relationship to reality. What the heck relationship does lighting in 1996 have on temperatures circa 1900? Here is an example. Prescott Arkansas is one of the rurals now adjusted. 2000 population was 3700. Here is the unadjusted data. Change data_set=1 to data_set=2 in the URL to get the adjusted graph. Unadjusted has initial year about 1.3C warmer than final year. Adjusted has initial year about 0.6C warmer than final year. The adjustment goes in the wrong direction. Not all stations go the wrong way, but it seems luck of the draw as to which way the adjustments go. There are even a few rural stations such as Pictou and Gravenhurst that haven’t reported in 90-100 years, but now are considered in need of adjustment due to lighting in 1996. Teleconnection across time maybe? Or maybe the idea is simply to be able to say they made an effort at UHI adjustment even if it bears no relationship to reality. Your figures are approximately correct, but the comparison should have taken into account that prior to the change to “global” nightlights most North American stations were already classified on the basis of nightlights rather than the population figures. The numbers you show are a little bigger than they should be, but close enough to show why I am surprised that no peer reviewer or editor insisted that these numbers be shown. They’ve changed the adjusted/unadjusted status of 367/2071 of the N. American night lights with their new lighting class. The rest of the world they used the RSU designation. Here is how those stations have changed. I used the step2 output from ccc-gistemp-0.6.0 for the station data as those are the stations used in the final analysis. 3008/6113 stations used at some point in time are adjusted. 1377/2329 in 2010 are adjusted. I frankly don’t think their adjustment method has much basis in reality. Especially when they use mid-90s lighting to classify stations that closed decades before. For UHI adjustment, what is important is change in urbanization. If Prescott has grown since 1900, the degree of urban heating will have increased, and the trend should be adjusted for that. If it shows as urban now, whether that is 1996 or 2006, it is assumed to be a candidate for adjustment. You do not need to know whether it was urban or rural in 1900. 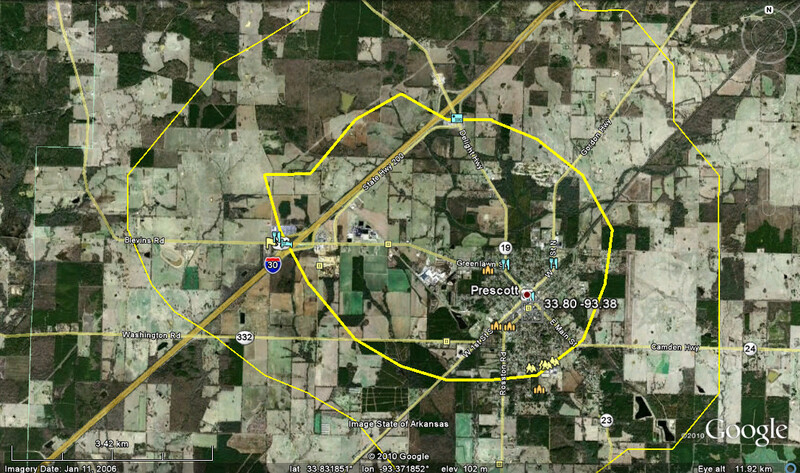 I lost a bit of this comment in posting: the heavy yellow contour is at value 10, the rural/periurban dividing line. The light yellow contour is at value 5, within the rural region, the cyan contour is at value 20, within the periurban region, but not yet reaching the urban level. On the basis of either nightlight data set Prescott, assuming the location specified for the station is correct, is located in a periurban region, and so gets adjusted. Hey. You are still listed on the updates page. I searched for oneill when looking for your name. Hadn’t seen your name correction. Over a decade ago GISS produced a neat pair of diagrams illustrating the warming effect of conventional “step adjustments” to flatten out the little cooling steps in data which can be seen to correlate with site moves outwards from an urban centre. 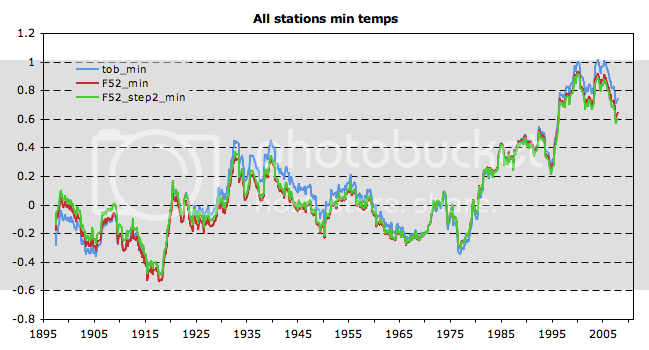 I have just posted on this and it is obvious that the NIWA seven station New Zealand series is riddled with exactly these warming errors which cement UHI into their century long trend. Warwick Hughes did not post his URL. While you are discussing GISS adjustments – here are a couple of emails from Dr Jim Hansen near a decade ago re altering USA rural data. 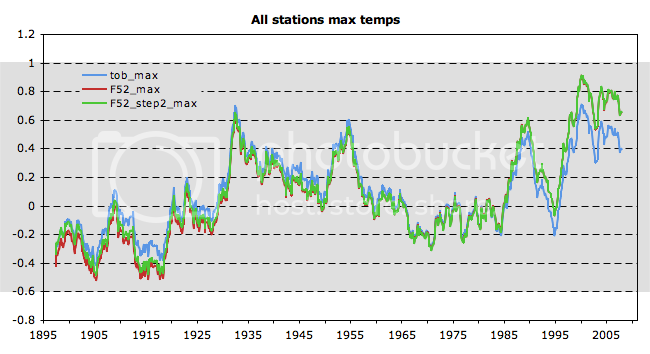 The Bureau continues to use (Tmax +Tmin)/2 for its calculation of mean temperature and the long term trend. However since 1994, GISS will be using the new means. It will need to adjust for the inhomogeneity. It can go back before 1994 to recalculate the means for Australian stations where there is three hourly data. Or it can simply remove data before 1994 as you report. As Trewin notes in his paper, the new method has its problems. If the station is on reduced hours, usually the night time and coldest temperatures are omitted, resulting in an upward bias. 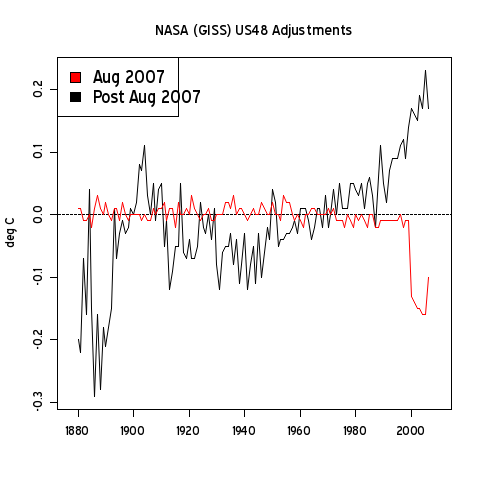 does GISS perform an adjustment to the CLIMAT data before GISS use it? are there other contries (or ocean records) whose input to GISS has a potentially similar break point? If all of the above is correct (and it has survived such checks as are available to me), then we are left with an intolerable system for proxy reconstructions which are calibrated against instrumental temperatures in a period when this change happened. It is not valid to do a calibration across such a significant method change. (Throw to the experts in USA who understand GISS, if any). 1) Calling this GISTemp’s adjustment is somewhat misleading, as they make it quite clear that they use NCDC’s USHCN F52 averages series as an input. Discussing NCDC’s adjustments and the Menne PHA is much more germane. 2) Interestingly enough, Menne’s PHA uses the much larger co-op network rather than other USHCN stations to compare nearby records to detect inhomogeneity. There will be some urban-rural smearing when urban co-op stations are used to correct detected inhomogeneities in rural USHCN stations, but it is as-of-yet unclear what the net effect will be. Given that these station comparisons are primarily used to detect larger step-changes rather than small differences, it is unclear if this process will matter for UHI calculations. 3) The best way to address this issue might be to create an alternative urban and rural F52 series using only urban and only rural co-op stations to adjust USHCN stations. Zeke, I take your point about the heading as the adjustment to the adjustments upon more detailed examination proved to originate with Menne. In the past, it’s seemed that upward adjustments are adopted relatively quickly and this seems to be the case here as well. As to the question of what the net effect of the Menne revisions, the impact on the GISS series is surely one of the most relevant metrics. And the impact here is the one that I reported – an impact of no less than 0.3 deg C since the 1930s. This has a direct effect on prior efforts purporting to reconcile GISS adjusted to the preliminary index from CRN1-2 stations since the GISS series has been unpinned from the version at the time. Surely a relevant point given the prior discussions. And again, the most plausible explanation for why the Menne adjustment produces this increased warming is more urban smearing. Am I the only one who finds it odd that Menne would separately ‘adjust’ each Tmin series from the Tmax series, and then ‘average’ those series on a point by point basis? Either Tmax and Tmin are linked on a day-by-day basis or they are not. ( with regard to ‘adjusting’ for station moves and all other purported changes that create ‘discontinuities’ worthy of adjustment). The same thermometer that is measuring Tmax is measuring Tmin. They don’t move it to a new place for the daytime max and then move it back for the nighttime minimum, right? Is there an answer that does not involve words like heteroskedacisity? There must be some “terrible assumptions” being made when adjustments to max temperatures are horribly inconsistent with adjustments to minimum temperatures. The only constant is the minimum temps are always adjusted to increase the warming trend. How can the same thermometer by “right” with the max but several degrees “wrong” for the minimum? There indeed may be case by case reasons, but as Hansen’s email to Warwick states, they apply a formula to the raw data that adjusts all minimums in the same manner. I also think it is more than the likelihood that ” Menne adjustment produces this increased warming is more urban smearing”. These adjustments introduce all the adjuster’s biases as to what adjustments “should” be made. Changes in latent heat loss versus sensible heat loss will effect the minimums and that happens due to changes in sewers that drain away rainfall, changes in water tables and changes in irrigation. Such changes can happen in rural vs urban via a multitude of permutations. They can happen close to a station or further away. Changes in frequencies of thermal inversions and wind flow will have drastic impacts on minimum temperatures as well, and that effects urban and rural in ways that must be done on a case by case basis. And as Watt’s Surface station analyses reveal, the proximity to waste heat, and differences in wind blockage will vary in such a way that using an adjustment formula based on population metric can never be applied in the same way to all stations. Furthermore where do they draw the line for regional differences. Many areas are definitely cooling while others are warming. There is no argument there. But those differences can cause apparent large deviations between stations that may look like outliers that incorrectly get ignored. When Levitus first calculated ocean heat content he ignored all temperatures greater that 3 deviations from the mean climatology. After some investigation it turned out that those large deviations were accurate representations, so the next calculations included every recorded temperature within 6 deviations. How do these Menne adjustments deal with such things? I suspect that although the UHI formulas generated for the Menne adjustments had some foundations in reality, they were never analyzed further because 1) they supported the group think of warming and 2) it is easier and cheaper to make adjustments from your computer in a cozy office versus verifying in the field. Steve- Menne has archived his detailed code. HOwever, it is not a very clear code and it will take quite a bit of work to understand its properties, It’s too bad that the method was not first published in a statistics journal. As Steve has suggested, it is probably worth diving deep into the code and running a variety of tests to determine the properties of the PHA. In fact, this is likely where I’ll be going next. However, I think when you say “There needs to be more pressure to reveal the exact Menne algorithm and see how it applies to each and every station. That is the only way it can scientifically be replicated and validated.”, this is unfair. ftp://ftp.ncdc.noaa.gov/pub/data/ushcn/v2/monthly/menne-williams2009.pdf (see section 3), and the code itself is available. I was able to compiled an run it. Furthermore, we can see the station by station adjustments by comparing the TOB dataset to the F52 dataset. I will grant you that as of right now there cannot be an exact replication of the F52 dataset because the additional COOP database and HIS files have not been released. Granted a tad unfair, but if I remember rightly the Menne paper does not address how to deal with different trends between maximum and minimum inhomogeneities. They discuss pairwise comparisons between stations but not max and min within a station. If their pairwise analysis shows no major adjustment for maximum temperatures, but severe inhomogeneities for minimum temperatures, then the problem is likely not due to bad or changed thermometers. So then what exactly is the rationale for large adjustments to the minimums? Due to greater convection in the day time, maximum temperatures give us a better metric because the air layers are not stratified as they tend to be at night and in the winter. Max temperatures also provide a better estimate of how the earth is heating up, and often the max temperatures show cooling trends similar to the sunspots. Using adjusted minimums worked into the average create a framework that suggests the world is overheating. Some of the classic papers of climate change such as Parmesan’s on the Edith Butterfly extinctions use a misleading average temperature to suggest extra heat has caused the extinctions, when that is far from the case. The maximum temperatures may be a better fit with paleotemperatures. Tree ring data is more sensitive to maximums since, except for the CAM plants, photosynthesis is driven by daytime constraints. Instrumental annual averages show greatest increase in winter and night- when very little tree growth occurs. The divergence problem and need to hide the declines, is due to framing global temperature changes on averages that have been driven by minimum temperatures. Minimums will have much greater variation for reasons mentioned above, as reduced night time convection does not average out the temperatures of stratified air layers. The same statistical smoothing that corrects inhomogeneities in maximums, will be overly sensitive to the much greater variations in minimums. Averaging max and min temperatures is then like averaging apples and oranges. Finally if their pairwise analysis is unbiased I would expect to see a scatter of adjustments some up some down. And, to be fair, I do see that in the maximums, (admittedly only using an eyeball check- not a statistical analysis). Regards minimums I would expect to see a greater scatter of minimum adjustments due to the greater variability. Instead I see an overwhelming trend that lowers early 20th century minimums and generating a larger trend minimums and average. My issues are greater than just the availability o COOP data. For example in this week’s EOS a study of satellite data by Doussett looking at heat islands in Paris during th August 2003 heat wave. Small parks were 2-3 degrees cooler than their surroundings and large parks were 4-5 degrees cooler. A one percent cahnge in the vegetation index of a city created a 0.2 degrees of cooling. Convenient algorithms that simply use populations numbers will never address those microclimate scale differences, that will affect every station differently whether they be city or rural. Again that’s why each station needs to be analyzed for the validity of the assumptions that I do not believe the Menne pairwise comparisons can accurately deetermine. Urban spreading is not the only possible explanation. The correction of the cooling bias introduced by instrument changes (CRS to MMTS) is likely a large factor as well (e.g. http://rankexploits.com/musings/2010/a-cooling-bias-due-to-mmts/). There may be something odd going on pre-1895, however, as USHCN records only go back to 1895. Post 1895 adjustments changes seem somewhat expected, as there is little positive adjustment until MMTS sensor changes start kicking in ~1985. Anyhow, I’ll be working over the next few weeks to create two F52 series: one that uses only urban coop stations to adjust for inhomogenies in urban USHCN stations and one that uses only rural stations for rural USHCN stations. The results should be a good test of how much of the positive adjustments are due to potential UHI spreading vs. other factors. 1) How/where are you getting the full COOP temperature database with the non USHCN stations? 2) I’m assuming the F52_step2 mentioned in those charts is referring to the FILNET portion of the USHCN software? 3) I agree that the CRS-Only graph does seem to indicate that urban spreading is not the reason for the temperature increase post-adjustment. model.” I read this to mean that the F52 is more concerned with getting a “correct” climate signal than in preserving the signal due to urbanization. Even with this consideration, the signal seems to be much stronger than in the F52 dataset. This would seem to indicate that either there is some other non-UHI inhomogeneity that is biasing faster growing stations higher, or that indeed the PHA is diluting the UHI signal. I ran some tests with pseudo-data on the PHA highlighting the scenario where the PHA will remove the UHI signal WITHOUT actually removing the UHI contamination itself. These 2 videos show some of how GISS has changed in recent years. They are simple enough tat most will understand them.